Most of us are familiar with pain scoring. It's when a doctor or nurse asks us to rate the pain we're experiencing with a number, for example, 0 to 10, with 0 indicating almost no pain, and 10 signifying excruciating pain. "… [A] pain score is a subjective number that gauges a patient's pain intensity based on behavioral and physiological parameters," says Dr. Phil Zeltzman, writing for Veterinary Practice News. The Colorado Pain Scale uses just five numbers (0 to 4), making it quick and easy to use. Unfortunately, pain scoring is almost exclusively a human medicine tool. The veterinary community hasn't yet "embraced the concept," according to Zeltzman, and I've certainly seen evidence of this myself. I still regularly have pet owners tell me their vets won't administer pain medications after extensive surgeries or accidents, despite some clients begging for them. This breaks my heart for the animal having to suffer unnecessarily and enrages me that doctors who take an oath to relieve suffering are failing to do so. Zeltzman, a board-certified veterinary surgeon with a traveling surgery practice covering eastern Pennsylvania and western New Jersey, urges his veterinary colleagues to get onboard with pain scoring. In veterinary medicine, our patients can't tell us in words how much they're hurting, so pain scoring must be done primarily through observation. It can be used not only with animals who've had surgery, but also any pet dealing with an injury or illness. Since every animal is an individual with a specific pain threshold, to use pain scoring effectively, we must observe the patient before painkillers are given and before any procedure is attempted, no matter how minor (e.g., a blood draw). We also need to apply some science to the art of observation when determining a pet's pain score. We need to know average pain levels for the condition the animal has or the surgery about to be performed, and factor those into the equation. This is necessary because many dogs, and especially cats are stoic even when in significant pain. "We all have encountered a young Lab hit by a car," says Zeltzman. "Despite extensive open wounds and fractured bones, he might be wagging his tail. The same applies to cats that may be purring despite significant trauma. Therefore, expected pain levels for a particular surgery or condition are taken into account when we give a pain score." • Pain scoring increases the awareness of everyone on the vet staff who is caring for the patient. It also allows for customizing and modification of pain management protocols based on the individual pet and the procedure being performed. "[Using the Colorado Pain Scale] a pain score of 0 or 1 should be our goal," says Zeltzman. "A score of 2, 3 or 4 should lead you to immediately reassess the analgesic plan and better understand what is happening to your patient." • Pain scores are not static — they change over time depending on a wide range of factors, including patient characteristics, veterinary procedures performed, pain medication and dose timing, and others. Pain scores in hospitalized patients should be taken every few hours. • Zeltzman suggests veterinary staffs incorporate pain scoring as the "fourth vital sign" following temperature, pulse and respiration (TPR) measures. 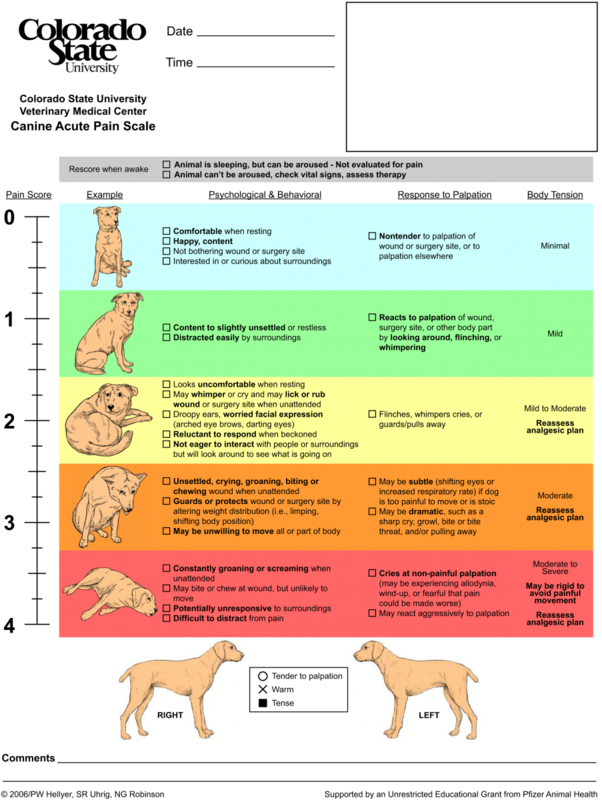 Pain scales such as Colorado State University's (CSU) are obviously intended for use by veterinarians and their staffs, but they can also be helpful for pet parents who want to learn what signs to look for to determine if their dog or cat might be in pain. No pain present. The patient is happy, acts normally, moves comfortably, has a normal appetite and (if applicable) does not bother the surgery site. TPR is normal. Mild pain present. This is usually displayed by a slight limp, difficulty getting up or down or a slight increase in TPR. The patient is eating, tail wagging or purring and not depressed. Moderate pain present. The patient shows sensitivity and may lick or chew at the surgical site or wound. The patient may vocalize, may refuse to eat and may seem depressed, and has slow, shallow respirations. Severe pain present. Signs include depression, reluctance to move and sensitivity at the surgical site or wound. The patient will usually not eat, may vocalize and may lie down but not sleep. Excruciating pain present. The patient shows all the signs described with a pain score of 3, in addition to intermittent panting, increased TPR — even at rest — constant vocalizing, profound depression, dilated pupils, aggressiveness and deep breathing. To view the full detailed CSU pain scales, which include rough drawings of how your dog or cat might appear with a pain score of 0, 1, etc. 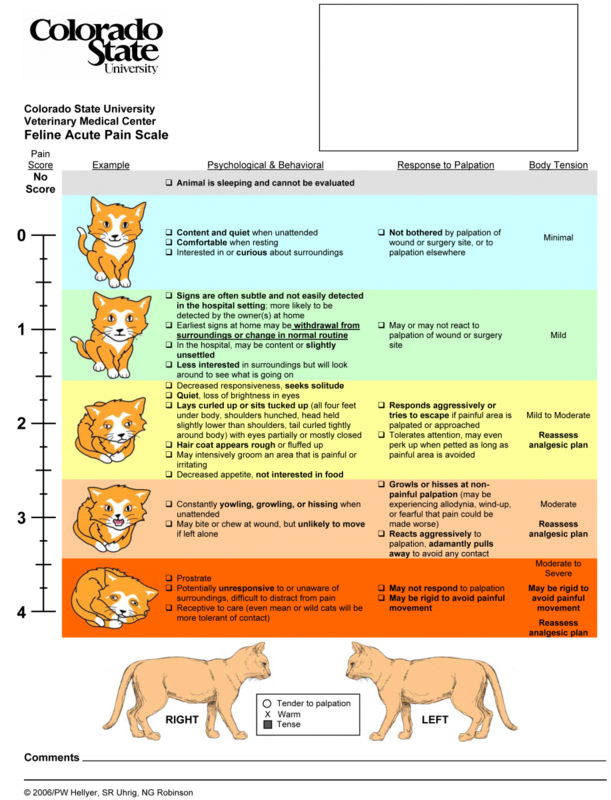 : Canine Pain Scale, Feline Pain Scale. There are also some newer therapies I've used with good success, including the Assisi Loop, a form of pulsed electromagnetic field therapy. In addition, there are a number of beneficial supplements you can add to your pet's diet, again depending on his diagnosis and treatment protocol.